Can Japan’s laws keep up with its emerging internationalization? Hafu, which is how the Japanese pronounce the word “half,” refers to a person who is of mixed Japanese and foreign descent. The hafu population in Japan has been growing steadily, along with their prominence. Mixed-race tarento are, for instance, an ubiquitous presence on Japanese television. According to Japanese government statistics, 6.1 percent of Japanese marriages in 2006 were between a Japanese native and a foreign native, compared to 3 percent in 1989. 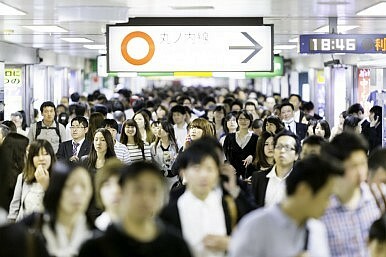 The number of foreign nationals residing in Japan has also been growing. Compared to 1.3 million foreigners in 1989, the population has grown 60 percent in 20 years, with 2 million foreign residents in 2012. Slowly, reluctantly, Japan is becoming more international. Traditionally, Japan is a very strong monocultural society. This is helped by tough rules on citizenship. To obtain Japanese citizenship at birth, a child must have at least one Japanese parent. Dual citizenship is not permitted. Yet traditions aside, hafu are widely admired in Japan, particularly by the younger generation. Many celebrities and fashion models are of mixed race, which could explain why many Japanese girls like to dye their hair lighter, or use colored contacts. Hafu are also assumed to have foreign language abilities and to be well traveled. A 2013 documentary called Hafu follows a few of these mixed-race residents of Japan, and explores what it means to be a “hafu.” The film’s general message is that Japan is indeed changing, with greater acceptance for people who are of mixed parentage. The Japanese Nationality Law states that to become a Japanese citizen through naturalization, the applicant must relinquish their current citizenship. If Japanese person becomes a citizen of a foreign country, they automatically lose their Japanese citizenship. A half Japanese person who automatically obtains dual citizenship by birth must make a choice by the age of 22. However, there is no punishment for violating this law, and it is widely flouted. In November 2008, Liberal Democratic Party lawmaker Taro Kono submitted a proposal to allow dual citizenship, but it was quickly shot down. Another proposal that surface around the same time would have given Japanese citizenship to residents of Korean descent, referred to in Japan as “Zainichi.” Under the San Francisco Peace Treaty, these people lost the Japanese nationality they were given as part of the Japan-Korea Annexation Treaty. However, this proposal was rejected by the Zainichi community, since they did not want to lose their Korean nationality, but rather sought the right to participate in Japanese politics while still holding Korean citizenship. Maintaining a “pure” Japanese political system might be one of the reasons why Japan is against allowing multiple citizenships, since by law civil servants must hold Japanese citizenship. However, by permitting dual citizenship, Japan could increase its human capital. An example might be allowing the Japanese diaspora, such as the community in Brazil, to return to Japan without relinquishing their current citizenship. This would also help Japan globalize. Without Japanese citizenship, there are larger hurdles to overcome. For example, when renting property, most real estate agencies require a Japanese guarantor if the renter only holds foreign citizenship, even with full-time employment. Although Japan is moving toward social acceptance of mixed races, the current legal status of people with mixed nationalities is likely to impede the country’s ongoing internationalization. Kyla Ryan is an editorial assistant at The Diplomat. Mixed-race individuals and their families seek acceptance in a homogeneous Japan.